The Ring Clock is a sweet novelty that combines jewelry with a timepiece. 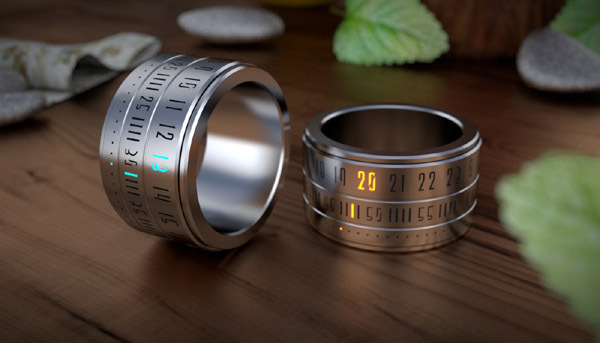 It looks cool, and it will definitely get you plenty of attention when people noticing you looking at your finger to check the time, but it’s probably not going to be everybody’s watch of choice. Made of stainless steel, with an LED to light the numbers, the Ring Clock is built to last for a while, but it’s not built to last forever. There’s no way for you to change the battery so you’d either have to pay someone to do it or just settle for having a pretty ring with numbers on it that doesn’t do anything. Also, this is one ring you don’t want to get wet, so you’d have to be extra careful to make sure you don’t forget to remove it before washing your hands. On the plus side, it’s easy to tell time, with the hour on the outer band, the minutes on the middle band, and the seconds on the inner band. Also, the ring is very eco-friendly, extending battery life by activating the LED only when you rotate the ring to check the time, and then de-activating a minute later. The negative points won’t rule out the ring for everybody but we’ll probably wait until the next version of the Ring Clock comes along. If it sounds interesting enough to try now, you can slip one onto your finger for $235. OK, you can’t change the battery, but the video does show it has a wireless charging/setting base. Too bad it isn’t even rainproof.